Today I am writing about the one thing that is the most valuable thing a person can ever have and that is his or her health. Without good health a person has nothing. The wealthiest person in the world has nothing if they are not healthy enough to enjoy their riches. The most talented person in the world is useless if good health does not exist within them. The fastest runner in the world can not become the fastest runner with broken legs. Okay, I’m sure you get the idea. 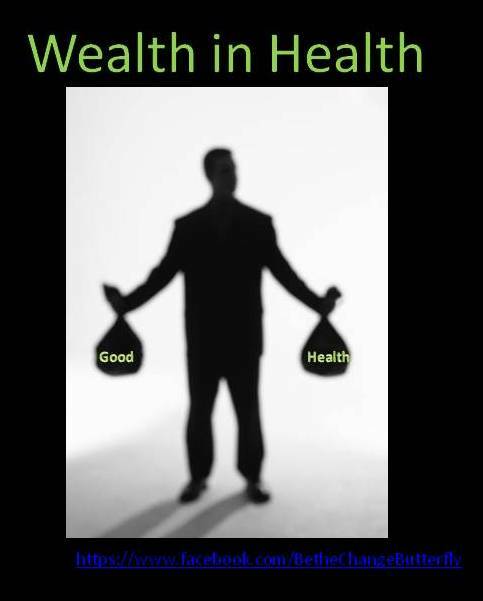 I am expanding on this idea of wealth in health because I’ve come to realize that if I want to change my life for the better in all of its entities (i.e. career, relationships, finances) I need to start with my health. I can be good at my job but if I don’t feel 100% in my wellness my abilities to carry out my duties in the best possible way will not be 100%. I can work towards a better job (ie, honing my present skills) but if an ailment befalls me then those job skills don’t progress as fast as I’d like them to. My intentions of getting all that work load done can be haulted by a headache, a stomache, a head cold, or something far worse. Even taking a sick day can set me back on my work load but sick days must be taken because everyone likes to share except when it comes to germs. Passing along an illness is like passing along that fruit cake no ones wants; not welcomed! What is welcomed is having good social relations with others. However, my health effects the people I mingle with on a regular basis. If my health gets me down I’m not feeling up to hanging even with the best of company. Sometimes my health holds me down to the point that I get depressed, I want to be alone, and I start to get the “Why me” syndrome. That’s when I want to smack myself with a bottle of “Wise up! You’re better than that!” and remind myself this too shall pass. Friends understand when I am sick but if I start to stay away for too long they start wondering about me. It’s not enough to be physically healthy; I have to be mentally healthy too in order to socialize and join the party. Socializing is an expense I can’t afford to lose. Other expenses in my life I’d like to improve on are my finances (ie, debt and savings). If an ailment takes over I need to take time to rest but that means taking time away from my money maker. Let’s also add in the cost of getting better when feeling under the weather, which decreases my wallet size. It’s a vicious merry-go-round I’d like to jump off. Oh the ills of my physical wills ails my money pails. Today I talked about how health effects my ability to change my life. Good health is the most valuble thing a person can have. Imagine what you can do in your life all because you can read, you can walk, you can talk, you can breathe. You can change so much in your life as long as you have your health. May your health always be with you. Gallery | This entry was posted in Be the Change Fitness and tagged Career, Change, Finances, Health, life, Progress, Relationship, rest, value, Wealth. Bookmark the permalink.